I have a Maillard freewheel, big cog stamped 10 - 84, which i have taken apart, cleaned, lubed, and reassembled following the excellent youtube by RJ the bike guy. i don't know for certain, but i may have "misplaced" the spacers which slide down the body and allow the pin spanner locknut from crushing the bearings. the freewheel is back together, but i cannot tighten the locknut and still have the cogs rotate. Q; how far up the river am i, and what can i do to get new spacers/ what size? i used the original bearings. the bike has not had a hard life even though it's 30 years old. they were 1/8" passing through the Parks (spoke/ multi rule) gauge. kept the same number lower & upper races & used Phil Wood grease on the bearing races and just a drop of Tenacious Oil on the pawls & springs. 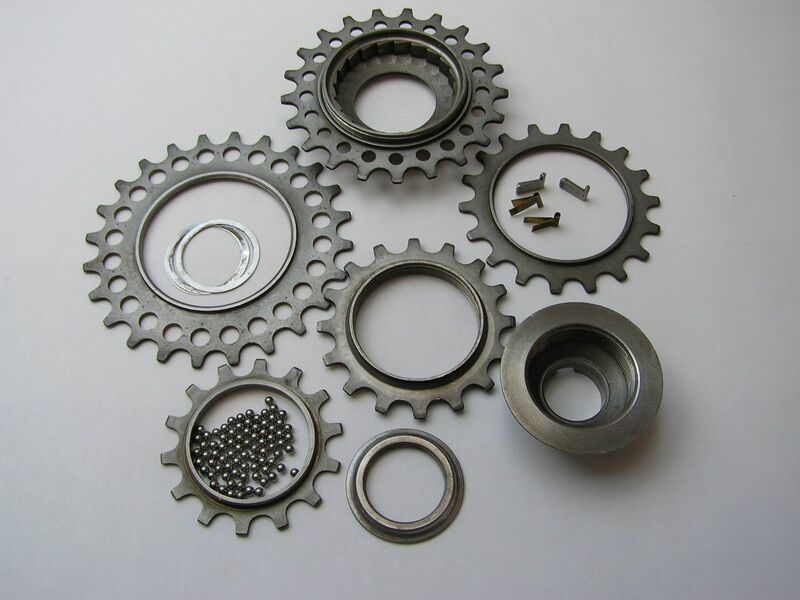 I'll bump the thread to ask if anyone perhaps has a rusted-out or otherwise "blown" or worn-out Maillard freewheel that they might disassemble and put some shims in an envelope to wherever(?) you are. A picture of the freewheel could ascertain which model it is, which might be critical to the shim ID and OD. I consider Shimano and Suntour freewheels of the 1980's to be vastly superior to the Maillard freewheels in terms of shifting quality, and they are easier to find. Last edited by dddd; 05-29-15 at 06:59 PM. The shims from a Sachs freewheel should also work. That looks as if it uses the Shimano splined tool for removal. If so the Sachs shims might be a good alternative. I try to save old shims when a body is badly rusted internally, so I might have what you need. The challenge is knowing how many and what thickness. Personally I wouldn't want to send you a bunch of shims only to find out you need one. I'd rather you send the freewheel to me for proper spacing without wasting any of the few I have. thank you for the most generous offer and i just may take you up on it! this week should be the litmus test. i had to order a freewheel removal tool (Maillard 40 mm x 24 notch if memory serves) and i have found 2 companies* that might have the parts i need. i've had to put it down for a couple of days and take a deep breath. i'll regroup and go at it again when the remover arrives. * Bike Tools Etc. - 1000's of bicycle tools and parts for the home mechanic! Loose Screws Bicycle Small Parts Hard to find bicycle parts, made easy! For both the classic and modern cyclist. Free U.S. shipping on orders $75 and over. With California pride, we pay your CA state sales tax! Unfortunately those are not the kind of spacers you need. In the first link, those are spacers for behind the freewheel and in front of the hub. In the second case, I believe those are cog spacers in order to properly index shifting. You need the very thin spacers which sit on the ledge above where the pawls fit and pivot, and hold the outer race/retaining ring at the proper place for good bearing movement. Not too tight and not too loose. Velo-Retro Vintage T-shirts, musettes, prints, catalogs, timelines. you are correct; the ones in the picture is exactly what i need. i still can't believe i misplaced (read: gone!) the originals. everything was bagged in ziplocks after degreasing. i tore through the garage yesterday and even - yuk- sliced open and pawed through the bag on the shop vacuum thinking they might have been sucked in by accident. this week will be the tipping point in determining the fix; i'm on such a steep leaning curve i'm surprised i don't have a nose-bleed. thanks for the help & suggestions. i like the fabrication idea if i get into a (deeper) bind.